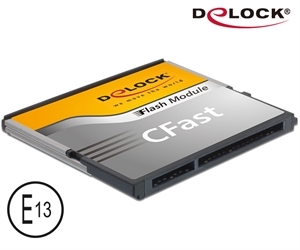 This Delock CFast Flash Card supports the new CFast 2.0 standard and allows even higher data transfer rates than memory cards of the previous CFast generation. It is therefore ideally suited not only for professional usage in photography, but also for all other applications that require fast read and write speeds. CFast 2.0 memory cards use the SATA 6 Gb/s protocol and convince with lower power consumption. This CFast Card has an extended temperature range of -40 ° C ~ + 85 ° C and supports the functions NCQ, iSMART, TRIM and iDATA Guard. NCQ: Native Command Queuing is a technique, which was developed in order to improve the performance of HDDs under certain circumstances. ISMART: iSMART is a powerful, easy-to-use solid-state drive SSD and hard disk drive HDD monitoring tool. TRIM: TRIM is a command for marking unused or unvalid data blocks on storage media for later re-writing. iDATA Guard: iDATA Guard is a comprehensive data protection mechanisum, which reacts before and after a sudden power break down.